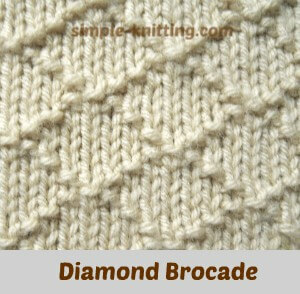 The diamond brocade stitch pattern is a very pretty design that's been around for a very long time. It is very simple to do and all you need to know is knit and purl stitches. Great for beginning knitters. The term brocade goes back in history a hundred years and it's a term used to describe a technique that is used to decorate fabric. Brocading is done by weaving intricate and elegant patterns and decorations onto the fabric. Originally the fabric was made of beautiful silks with gold or silver threads added into it. Precious stones like diamonds and rubies were also worked into the brocading. It gave the fabric an extra layer of warmth although it was very heavy, but simply beautiful. Can you imagine those diamonds and rubies worked through the fabric? Today of course beads and sequins are mostly used instead of the precious stones and while silk is still used so is cotton, rayon and polyester. The outcomes are all very beautiful. I hope you'll forgive my little knitting history lesson. I have heard the name brocade many times but never really new what it actually was. Just thought I would share it with you too. And with this little piece of information can you imagine using some beading or adding an extra color to this pretty diamond stitch pattern? Of course it still looks very pretty all on its own too. Rows 4 and 6: Purl 1, *knit 1, p 5, knit 1, purl 1; repeat from * to end. Row 5: *Purl 1, knit 7; repeat from * until 1 stitch remains, purl 1. Row 8: Purl 3, *knit 1, p 1, knit 1, purl 5; repeat from * until 6 stitches remain, k 1, purl 1, knit 1, purl 3. Repeat rows 1 - 8 for this diamond stitch pattern. Enjoy creating with this pretty stitch pattern.